Submitted by lynn on Sunday, June 29, 2014 - 8:59pm. I recently saw Eureka! at the Bacon and Barrels event in San Diego with their award-winning Maple Bacon Old Fashioned. We were later invited to dine at Eureka! and find out more about the restaurant. It was a beautiful day to be sitting outside in their large patio area and we were looking forward to trying a few items from their menu. Eureka! 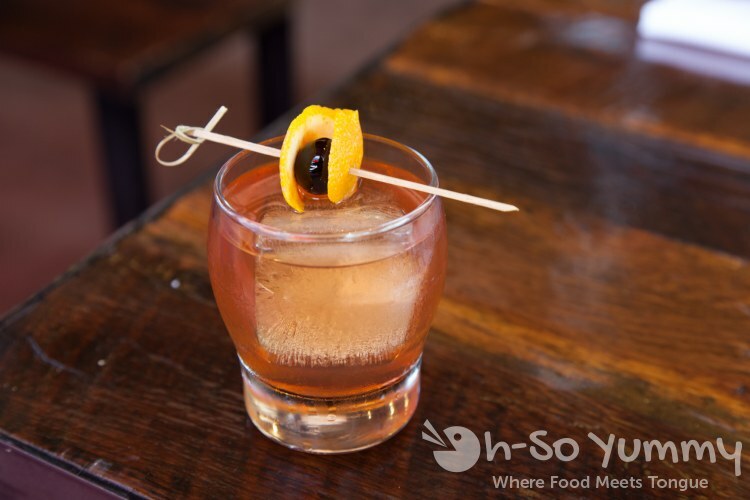 has plenty of craft beer and whiskey options so Dennis started out with the St. George Spirits Breaking and Entering Bourbon served as an old fashion muddled. This drink can be served on the rocks or however you prefer. Dennis thought it was very smooth and had a lighter, mellow flavor. Eureka uses these huge ice cubes to keep the drinks cold, which slowly melts, keeping your drink from getting diluted too fast. The garnish above includes these dark gourmet maraschino cherries, not as sugary sweet as the bright red ones you'd normally find with fruity cocktails. The Osso Buco Riblets came out wildly covered with orange sauce. These had a flavor similar to buffalo wings but didn't carry as much heat. The meat inside was firm but tender enough to bite off the smaller thin bones. The only drawback is that you don't exactly know where the bone is going to be, as compared to a chicken wing, so you should not eat too fast! The serving size was perfect for sharing as an appetizer. 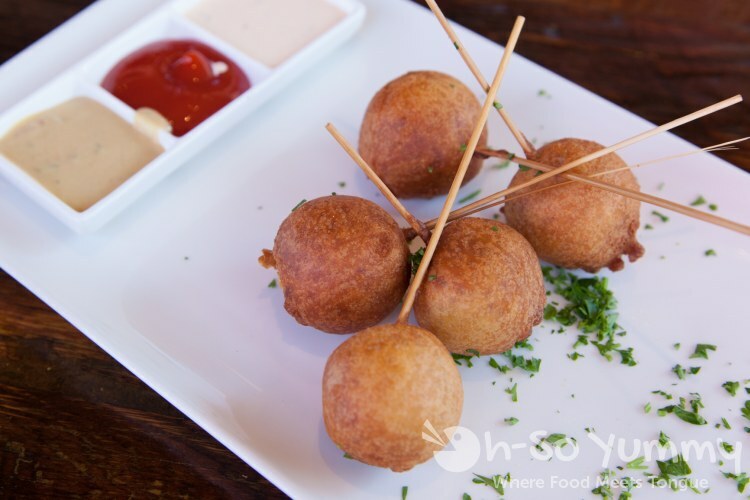 The Lollipop Corn Dogs were not the typical elongated shape you'd expect but were round instead and served on a very thin stick. These were succulent house-made sausages covered with fried crispy dough. The greens were garnish mostly because they didn't stick onto the corndog. It came with the choice of three different sauces, a spicy porter mustard, homemade ketchup and ranch. I went for the slightly sweeter ketchup. I saw the Watermelon Salad before on a previous visit and had heard it was popular. It used to have larger slices of watermelon but the new version, updated within the last month, came with smaller refreshing morsels immersed in the salad. There's a very light balsamic dressing that doesn't overpower the rest because you can taste all the individual ingredients of the salad, especially the distinct arugula. I was happy to try something healthier with quinoa but this dish works best if you like the taste of raw greens. The Tortilla Burger piqued Dennis's interest so we ordered it. It contained the basic hamburger ingredients but was wrapped with a chargrilled tortilla, which held its shape during the meal. The juices did come out in one or two spots due to the juicy medium rare patty and other contents but not enough to create a big mess. I thought it was nice way to cut down the carbs without going lettuce wrapped which, like the tortilla, is another option for any of the other burgers. Dennis is a huge fan of their sweet potato cinnamon fries upgrade. It comes out a little softer but this works because they don't taste soggy. I like the pieces without the honey drizzle on it but that touch is the sweet tasty treat Dennis craves. And, I did keep eating them because the fries themselves were so darn tasty, even with a little honey on it. 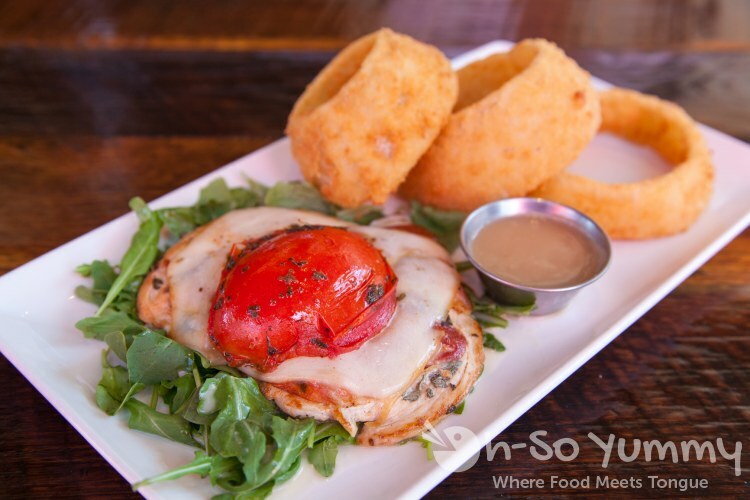 We also ordered the Naked Chicken Saltimbocca which is a pounded out chicken breast topped with proscuitto, smoked mozzarella and a roasted tomato. The thin cut meat was still juicy though some were cooked a little more than others but wasn't tough at all. It's very light for the diet too because it comes on a bed of arugula. The dipping sauce that came with it wasn't an overbearing lemony sauce and had the consistancy of gravy. We got the upgrade to the panko crusted onion rings that were lightly breaded and don't leave you feeling heavy. There were only three but they were pretty large in size. I could cut the onion rings with my fork or dip it in the yummy buttermilk ranch sauce that came with it. 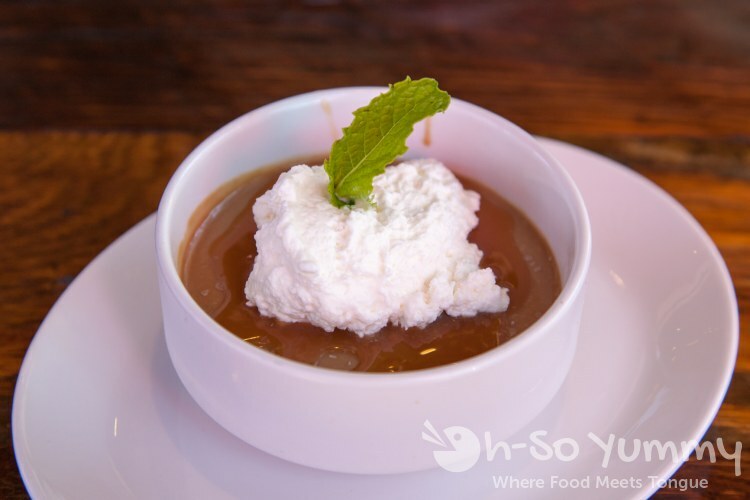 To finish off the meal, we tried the Goldengate Butterscotch Rum Pudding. We usually don't like butterscotch items because it can be really sweet but during some bites, I'd hit some sea salt that counteracted the sweet in a good way. Still, it ends up being a little rich for me but much more palatable than other butterscotch desserts I've had. 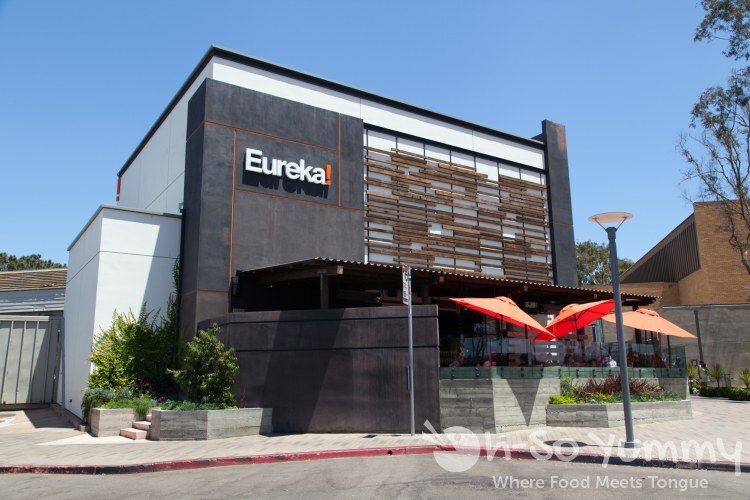 Eureka is located in the UTC mall block close to the movie cinema and 24 hour fitness so parking could be a little harder during busy mall hours. They have a daily happy hour from 2-6 so check it out for some deals on grub and beers. Also, the fig burger here is delicious and I'm pretty sure I'll be ordering it on my next visit! I really like their watermelon salad - I find it to be refreshing and also feels like I'm eating something a lot fresher/healthier. It's a nice mix of flavors. Hmm, that butterscotch pudding looks pretty good, plus the addition of salt in it sounds extra yummy in my mind. 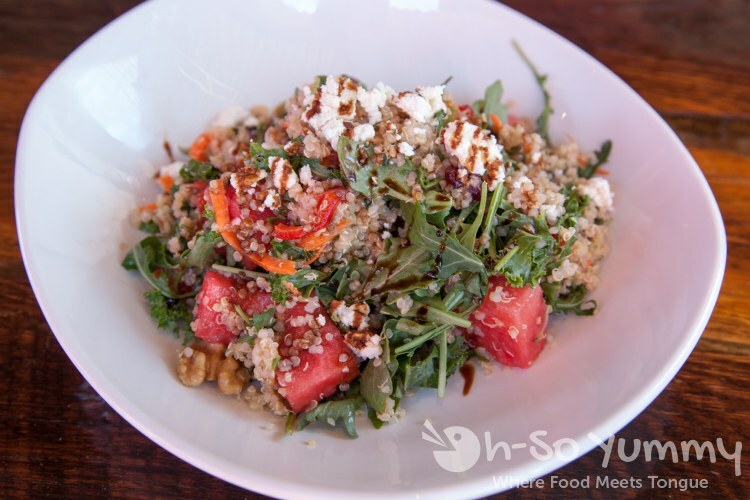 i wish i had tried their original watermelon salad so i could compare them but we usually end up with burgers here! bunny salads leave me hungry unless there's more protein in there! 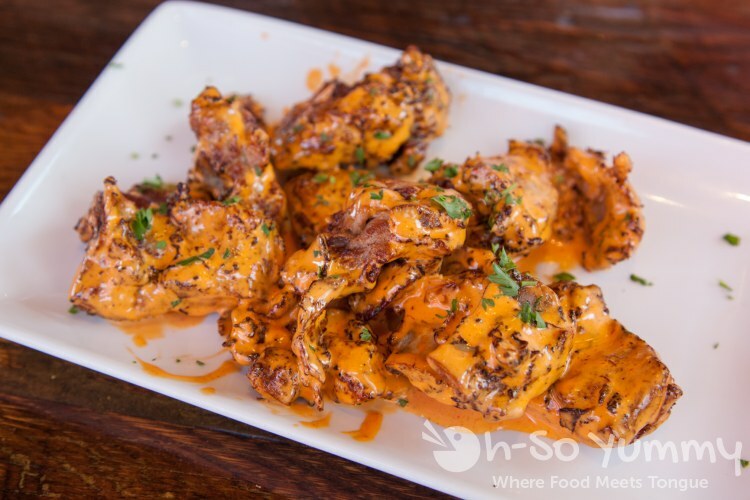 I've been reading so much about this place from you guys (SD food bloggers) that I am intrigued to try it out when I am in the area. 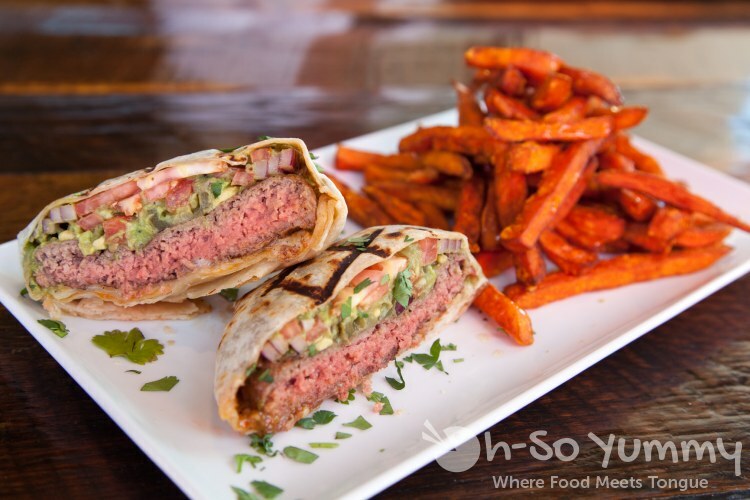 I'll look to your blog posts when trying to decide what to order! Oh the tortilla burger looks good! Wish I ordered that on my last visit there. We considered trying the Naked Chicken but opted for a sandwich instead. I like gravy so that dipping sauce would be great . I've been on a health kick lately so this particular meal ended up on the healthier side. The biggest carbs were really the fries and onion rings. I like that they have a lot of tasty options! Did you think the saltimbocca was the right portion size? Just looking at the picture, I feel I'd be hungry if I only ate that dish! Same goes for the salad. But when including the rest of the food, it worked out fine.